A bountiful harvest has begun here at Rosehaven Cottage thanks to one Santa Rosa plum tree that is laden with so much fruit some of its boughs are bending and touching the ground. This is really exciting for me because this is the first year that the tree has actually produced more than 1 or 2 plums. I LOVE plums (Hubby doesn't like them) so I am thrilled! Some of you may remember that I wrote about this plight earlier in the year when the tree was blossoming as I shared some photos of the lovely spring plum blossoms. Now the majority of those blossoms have become luscious plums that are ripening at varying rates all over the tree. Because sitting under the plum tree is one of my favorite daily activities, I have been watching and gently hand-checking the fruit each time I'm out there. Early in the ripening stages when a plum that's been within my reach has been ripe enough, I've plucked it from the tree and eaten it right there. Yummy! 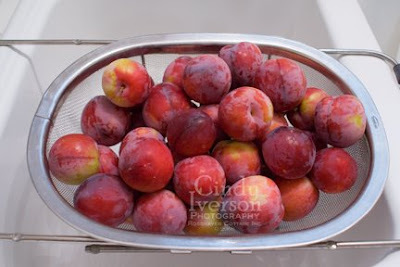 Well, now that the number of plums that are ripe has increased, I was able to take my harvest basket out and pick the first bunch of plums all at once. That was a real treat! The plums came inside and went into this nifty rinsing basket that Hubby has in the kitchen (the kitchen is Hubby's domain, by the way). After a good rinse in some cool water, the plums were covered with droplets and were very photogenic (as you can see in the photos above). Of course I've eaten the perfectly ripe ones as a wonderful sweet treat as part of my breakfast, lunch, or dinner. As the others ripen, I'm going to try my hand at making homemade fruit leather with our home dehydrator. I'll make sure and photographically document the process when I do so I can share. Now why, you may ask, am I featuring these fresh fruits on America's Independence Day? Well, today is also my own Independence Day. It was two years ago today that I made the life-changing decision to eat, eat well, and gain my independence from the burdens of a chronic illness as well as OCD-related anxiety and depression. Along with adopting the WeightWatchers lifestyle, I consciously chose to no longer consume any hydrogenated oils and products (trans fats) while increasing my consumption of Omega-3 fatty acids in the form of walnuts and other nuts. I also chose to eat instead of continuing the pattern of "forgetting" to eat all day--a pattern that was taking me down a very unhealthy road and had caused my metabolism to grind to a halt. July 4, 2006 was a very big milestone day for me, to say the least. As I've traveled this interesting health-focused journey for the past 2 years, I've come to love simple and luscious foods like these plums that I'm harvesting off our tree. Grown organically (as all the other produce in our garden), these plums are more than a summer treat for me. Instead, I see each one as a small package of health and wellness ready for me to consume and gain its benefits--the most profound benefit being independence. They look delicious!! !Happy July 4th! Hi Cindy, thanks for telling me more about the rose. I am so led by my nose with plants. Lovely bumper crop of plums- mine aren't ready yet. We're trying to eat more healthily too- we get an organic veg box delivered each week and the taste is so different from supermarkets. We're also trying to buy free range chicken after hearing how broiler chickens are raised and how their meat has as much fat as a hamburger and no omega 3 in. http://www.ciwf.org/ is a good site. Good to hear we're not the only ones trying to make changes. Oh, I loved this post! I'm partial to the plum, so I'm incredibly jealous of your plum tree. Congrats on your first year of your new lifestyle. A few months ago, I made some of the changes you talked about. I need to read about OCD and anxiety. I really have problems - no joking. 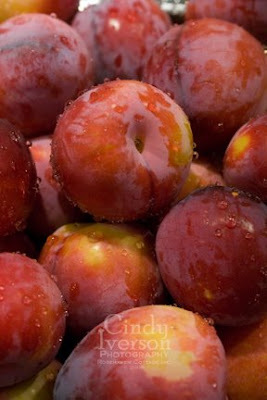 oh...these juicy ripe plums simply bought waters to my mouth...so tempting...Hope you had a wonderful Independence day & wishing you all the very best of your health...Wonderfully captured shots! Congratulations on your 'birthday'. I clicked on your links and found a lot of good info there for me and my girls. Thanks! Off to see if I have any walnuts in the house. The plums are certainly photogenic!I believe everyone can definitely benefit from having less hydrogenated oils in their diet and moving toward the "naturals." Thank you for sharing. 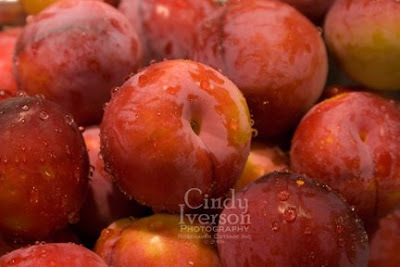 I want some(:)of those Plums.. LOL they look so mouth watering..
Just stumbled across your blog today. It's beautiful! Congratulations on your award. Can't wait to come back and see what's new!